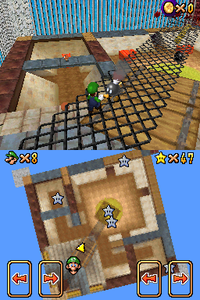 Battle Fort is an additional level added to Super Mario 64 DS. The entrance to the course is located in the castle's backyard, to the back-right. The entrance is covered with Blocks, meaning anyone but Yoshi can enter the course. Battle Fort consists of several ramps and platforms, patrolled by Heave-Hos and with large Boulders rolling across. 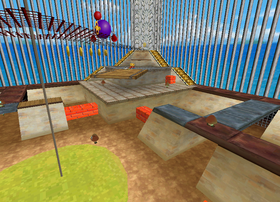 A Chuckya is located on the mesh wire platform up above and Bob-ombs continuously rain down as the player moves about. Several Goombas and Blocks are placed around the stage as well. In multiplayer, all the enemies are removed, except the Boulders, which only Wario can destroy. Like Sunshine Isles, there are ! Blocks with feathers that let players fly around the stage. There is only one Power Star to collect in this area: the player must collect the five Silver Stars scattered around the level while avoiding the enemies and obstacles. After collecting them all, the Power Star will appear in the Star Sphere near the player's starting position. This page was last edited on March 17, 2019, at 08:46.